The 2015 RSL Jerwood Awards for Non-Fiction, now in their twelfth year, are judged byJonathan Beckman, Jonathan Keates and Kate Summerscale. The three awards, one of £10,000 and two of £5,000, are presented to authors engaged on their first commissioned works of non-fiction. Thoman Morris, £10,000 for The Matter of the Heart, (Bodley Head, May 2017). A history of the heart in twelve operations – it is a compendium of the 20th Century’s greatest technological inventions and medical miracles. ‘Heart-searching, heart-stopping and heart-exalting’ commented Jonathan Keates, and to Jonathan Beckman it is ‘a tale of dare-devil experimentation and supreme ingenuity’. it will help my research. It’s a great honour to be recognised in this way – I’m very grateful for this vote of confidence, which offers renewed motivation to make the book as good as it possibly can be.’ – Thomas Morris, who is a freelance writer based in London. Catherine Nixey, £5,000 for The Darkening Age, (Macmillan, early 2017). This account of early Christians, from the Roman viewpoint, is, for Jonathan Keates, ‘a powerful corrective to our view of Christianity as a religion of peace, showing how it triumphed through violence, philistinism and wholesale barbarity’ and Kate Summerscale thought it ‘a riveting story’. There is always the odd nervous moment when you wake in the wee small hours and wonder whether anyone, apart from you, will be interested in what you’re doing – particularly so when it’s your first book. I’m surprised, delighted, and grateful to have won this award. Catherine Nixey, who is a Radio Critic for The Times. Duncan White, £5,000 for Cold Warriors: Waging Literary War Across the Iron Curtain, (Little,Brown, September 2018). A focus on writers on both sides of the Cold War which aims to give a complete view of the relationship between writing and politics during the era. ‘A nail-biting tribute to the power of words as weapons in the right or wrong hands at a key moment’, commented Jonathan Keates. things I’m profoundly grateful.’ – Duncan White, who lectures on History and Literature at Harvard University. 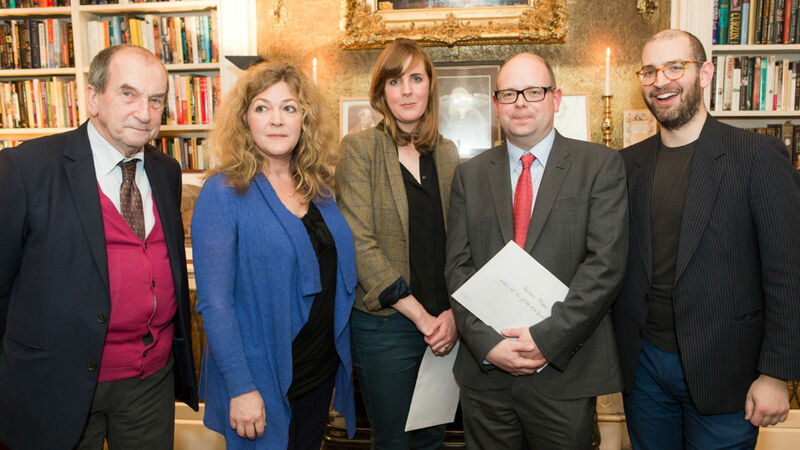 The three authors were presented with their awards on Thursday 26 November 2015 at an event held at John Murray’s house, 50 Albermarle Street, London. Image: L-R Jonathan Keates, Kate Summerscale, Catherine Nixey, Thomas Morris, Jonathan Beckman. Photo: Michael Jershov.